As you can guess, I really like tahini. I’ve been using it in desserts often lately, and I must say that it is particularly good with sugar to tame its bitterness (though admittedly the bitterness varies by brand). For the health-conscious, it contains protein and fiber as well as a fair amount of magnesium, calcium and iron. It also has a lot of fat, but I’m not too worried about fat from seeds. 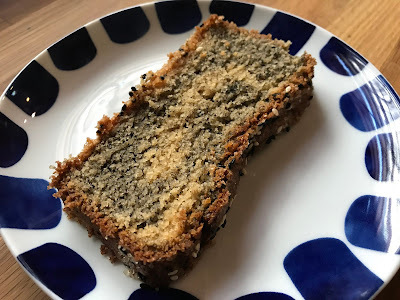 This swirled sesame tea cake cake was delicious, and the sprinkling of sugar in the greased pan instead of flour gave it a wonderful crackly exterior. The Engineer dubbed it “halva cake” and it was a hit! Preheat oven to 350 °F. Lightly coat an 8½x4½" loaf pan with nonstick spray. Line with parchment paper, leaving overhang on long sides. Lightly coat parchment with nonstick spray. Sprinkle sides and bottom of pan with white and black sesame seeds and sugar and shake around in pan to coat; tap out excess. Finely grind 2 Tbsp. black sesame seeds in a spice mill; set aside. Whisk flour, baking powder, salt, cardamom, and baking soda in a medium bowl to combine. Whisk yogurt and tahini in another small bowl until smooth (mixture will seize and stiffen at first). 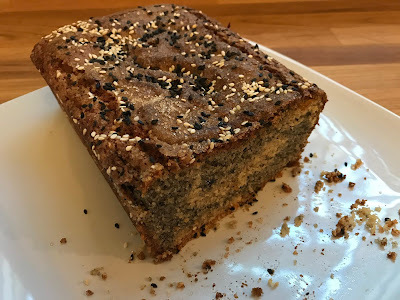 Sprinkle with more white and black sesame seeds, then with more sugar. Bake until a tester inserted into the center of cake comes out clean, 55–65 minutes. Transfer pan to a wire rack and let cake cool in pan 10 minutes. Run a knife around short sides of pan and use parchment to help lift cake out of pan and onto rack. Let cool completely.